The proper management of regulated medical waste (also referred to as biohazardous waste, biomedical waste, sharps waste or infectious waste) generated in healthcare facilities and commercial businesses is critical not only to avoid regulatory fines but also to prevent the spread of infectious diseases. Sharps and soft wastes (red bag waste), those saturated with blood or certain other body fluids, must be adequately handled, contained, stored, shipped and treated following all local, state and federal regulations. Working with an experienced and specialized medical waste management company that provides compliant systems and training ensures regulatory compliance. Sharps Compliance is an industry leader with over twenty years of experience managing comprehensive medical waste removal programs for health care facilities and commercial businesses nationwide. We specialize in small to mid-size medical waste generators and offer affordable options for both sharps disposal mailback and medical waste pickup service. Our Medical Waste Management Experts will develop a program to match your healthcare facility's needs. We develop programs for single locations (dental, veterinarian, skilled nursing, medical offices, and more) or chains with hundreds of locations. Individual state regulations, as well as volumes, usage, types of wastes, locations and mounting requirements, dictate container selection. Our sharps mailback systems include puncture-resistant, leak-proof sharps containers. We also offer systems designed to hold filled sharps containers and bags of soft waste. Our systems include the plastic container, prepaid shipping box, bag liners and tracking forms and meet or exceed all applicable regulations. In addition to our sharps mailback systems, we provide standard sharps containers for use with pickup or within our larger mailback systems. It is important for healthcare facilities to train employees on RightClassification - proper segregation of waste types and minimization to reduce over-classifying of waste. Over-classifying includes placing items into the medical waste that can go into the trash. Sharps prides itself on helping you to Right Classify your waste to reduce unnecessary costs. Do you classify waste properly? Take our quiz to see how your office stacks up. Sharps Compliance provides the best in USPS-authorized medical waste mailback services for small to mid-size generators. When facilities generate larger quantities of biohazard waste that is not efficiently manageable with mailback, we offer a pickup service. This blended service model permits Sharps Compliance to match the right service at each location, resulting in cost-effective and efficient management programs. Our medical waste & sharps disposal mailback systems offer the best in convenience and regulatory compliance and are available in a vast array of configurations to meet any facility need. All Sharps' systems pass rigorous testing for USPS approval for safe transport of regulated medical waste (UN3291). All biohazard mailback systems include a primary collection container, prepaid return shipping box, components to package for transport, waste manifest tracking form, instructions for use, proper treatment and online documentation of treated waste. All systems are uniquely serialized for tracking and provide complete cradle-to-grave compliance with local, state and federal regulations. Visit our online store for all mailback systems. Sharps Compliance owns and operates medical waste pickup services in fifteen states with a robust network to expand coverage nationwide. Biohazardous pickup services are vital for healthcare facilities that generate larger volumes of medical waste not suitable for mailback.When sharps mailback service is not the best fit for a location, typically due to volume, we provide a route-based biohazardous waste disposal pickup service. Our unique ability to blend services of both sharps mailback and biohazardous waste pickup offers our customers the best in accessibility and pricing. We deliver the same regulatory compliance assurances to both pickup and mailback locations, ensuring DOT standards, proper treatment and online documentation of treated waste is available. Sharps Compliance treats all waste responsibly and following all applicable regulations. In most cases, we autoclave the waste and then repurpose it into a new resource, thereby avoiding placing treated containers into a landfill. Our online medical waste tracking and documentation portal offer customers access to all waste manifest documents 24/7/365. This service is offered free of charge with no bookkeeping or records management fees like other companies charge. WHO REGULATES MEDICAL WASTE DISPOSAL? The disposal of medical waste is regulated at the state and sometimes local level. Our state map links to the various regulations. State and local regulations typically pertain to the labeling, containment, storage, transportation and treatment of medical waste. Some states require the generator to register with the state and maintain medical waste management plans. The transportation of medical waste is also regulated by USPS for mailbacks and DOT for pickup services. The EPA as well as state agencies regulates the treatment and environmental safety at treatment facilities. OSHA and CDC are responsible for identification and employee safe handling of medical waste as well as labeling and containment. OSHA requires bloodborne pathogens exposure control plans and training which is typically where medical waste management is addressed. *It is important to check with your state, as some require generators to register and have other state-specific requirements. WILL I HAVE TO CHANGE HOW I MANAGE MY WASTE WITH MAILBACK? No. You will manage your sharps and red bag medical waste following the same facility protocols currently in place. With mailback there is very little difference than what you do today: 1) collect waste, 2) package transport box, 3) complete and sign the manifest tracking form and 4) send for proper treatment. The only difference is the transporter. Also, you can manage your waste on your own time with a mailback as it is simply placed in the mail when ready instead of waiting for a driver to come pick it up. HOW DO I GET A SHARPSTRACER ACCOUNT? Simply contact our customer support team for a user name and password. You can access SharpsTracer at www.sharpstracer.com. WHICH MAILBACK SHOULD I USE FOR MY FACILITY? We carry the largest selection of USPS-authorized mailback systems available. 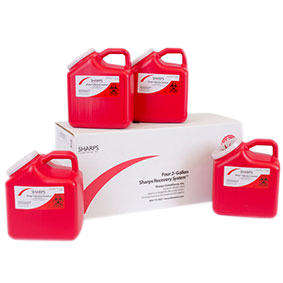 Simply locate the size sharps containers you are currently using at your facility. Next, match them to a similar size of our systems in our online store. We have systems that include a single sharps container and mailback box; systems that include multiple sharps containers in one mailback box; and medical professional systems which include a large container and mailback box used to hold your own sharps containers and red bag waste. Shipping and disposal/treatment for all systems is prepaid and includes the tracking documentation required by many states. If you have questions regarding the right system for your facility, contact us at 800.772.5657 and let our Medical Waste Management Experts help select the appropriate system for your needs.